Cambodia’s Deputy Prime Minister and Minister of Foreign Affairs and International Cooperation H.E. Hor Namhong held talks here this morning with visiting Mr. David McKean, Director of Policy Planning at the U.S. Department of State. The talks touched on the progress of the diplomatic ties and the visit exchange between the two countries, particularly the upcoming visits of the U.S. First Lady H.E. Mrs. Michelle Obama, planned on Mar. 20-22 and of H.E. Ms. Nancy Pelosi, Minority Leader of the U.S. House of Representatives, scheduled on Mar. 30, H.E. Koy Kuong, Spokesperson for the Ministry of Foreign Affairs and International Cooperation, told reporters. H.E. Hor Namhong informed his guests of the new political developments in Cambodia, especially of the Proposed Law on Organizing and Functioning of the National Election Committee and the Proposed Law on Election of Members of the National Assembly to be debated at the National Assembly during its extraordinary session on Mar. 19. 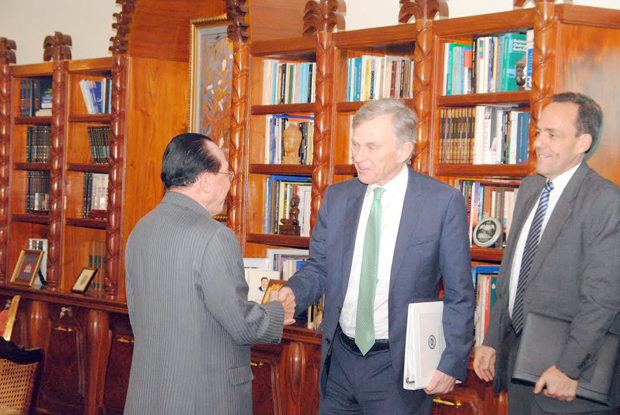 The Cambodian top diplomat also thanked the U.S. side for its humanitarian and development assistance to Cambodia so far. Regarding the South China Sea issue, H.E. Hor Namhong said that the parties concerned had been working together toward the conclusion of the Code of Conduct (COC) in the South China Sea. This entry was posted in International Cooperation. Bookmark the permalink.